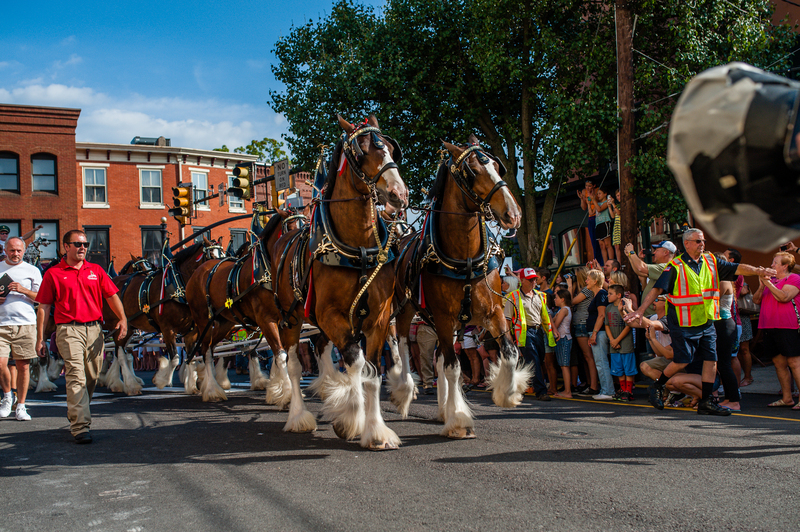 Recently, the world famous Budweiser Clydesdale horses rode through town to do a beer run. They actually had to drop off a case of Bud at each of the local bars. Well in any case, it became a spectacle. I wasn’t actually expecting it to be that ‘chaotic’. I’m not really going to talk about the horses. Sure, they were magnificent beasts, all very well mannered and groomed to perfection. No, I really want to talk about the cell phone or ‘iPhone-tography’ (is that what it is really called?) that’s just the craze these days. Yeah, that was me getting yelled at, and I wasn’t the only one. I overheard a bunch of other spectators getting nasty with other pros, and other spectators about sight lines, and standing there for hours. Some were warranted with kids, but most were just uncalled for. And, dear lord, 98% of the people watching these horses were watching them through their cell phones. Sorry this turned out to be more of a rant than anything else. I tried to enjoy the horses and their majesty, but as I walked around and saw the crowds, and all of them holding up their devices at arms length, sort of missing the whole point of why these magnificent beasts were here, I got turned off and lost energy shooting the event after the initial rush when the horses first set off. You will see in some of my photos what I am talking about. There were times I am guilty of such atrocities too when I am just spectating, but I know my limitations when I don’t have the proper gear with me. I tend to take one shot and just watch it happen. Not sure if anyone else here saw the Pope’s visit in DC, NYC and Philly. All you may have seen was a sea of cell phones coming up as the Pope went by. As a photographer, it is increasingly getting hard to land gigs, and even if you do get a gig, it’s fun trying to get around people getting in your way to get a shot, thus ruining a shot that you were hired to get. Try explaining to a client why you missed a moment because cousin Steve (or uncle Tom) jumped in front of you to take a pic with his iPhone. Blah…sorry, just had to get that out. Enjoy the Clydesdales. 1. How do these horses qualify to become a Budweiser Clydesdale?- They have to be a gelding that is at least four years old. They have to stand 72 inches, weigh between 1800 and 2300 pounds, be bay in color, have four white stocking feet, along with a black mane and tail. 2. Do the Clydesdales have names?- Yes they do. The names are kept short so that is easier for the driver to give commands, names like Captain, Mark, Bud, and Duke are used. 3. Eight horses are hitched together to pull the wagon. Two more horses travel as alternates. 4. Twelve horses are transported to each appearance in three fifty foot tractor trailers. 5. 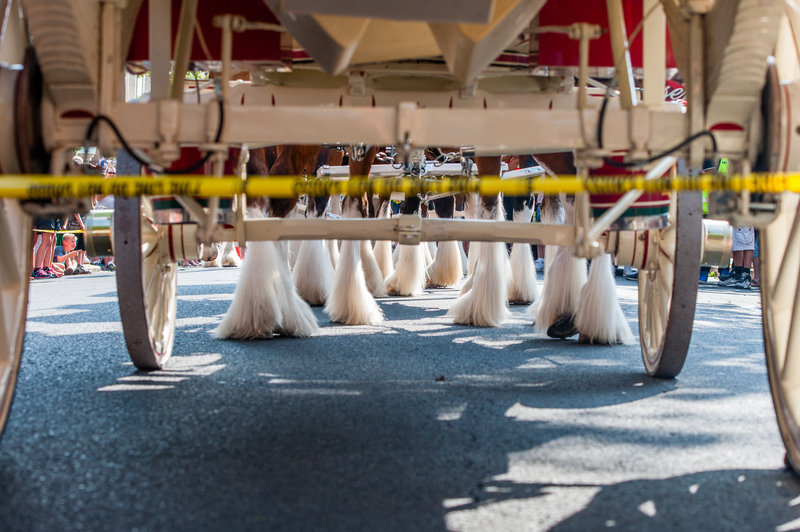 Expert groomers travel with the Clydesdales. They are on the road for about ten months every year. When needed, one handler has night duty to provide around the clock care for the horses, making sure they are safe and comfortable. love the pics! I sometimes wish I would get myself a real camera…but then I would just complain of how bulky it is. So, I’ll just depend on you guys taking the best pics ever.